Sunday morning was the Princess Half Marathon in Walt Disney World; however, runDisney couldn't let a race weekend go by without adding some extra magic to the mix. This time, the excitement surrounds an announcement tomorrow about what's in store for runners in the coming months. 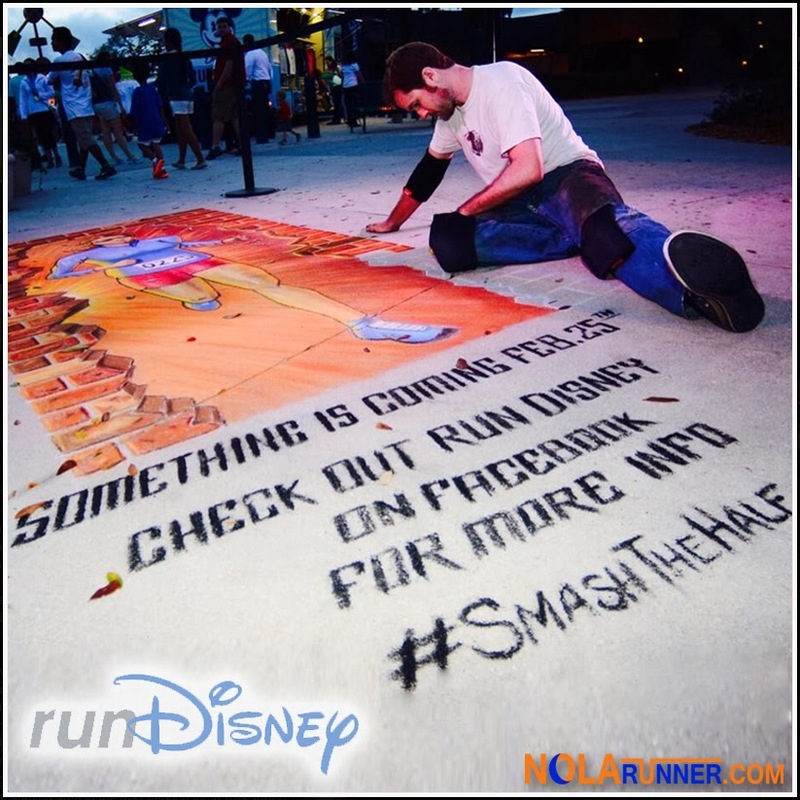 Sunday evening, as Princess Half finishers attended a post-race party in Downtown Disney, a street artist started sketching an image on the sidewalk. Hours later, Social Media was buzzing as photos started popping up with the completed sketch and final message. 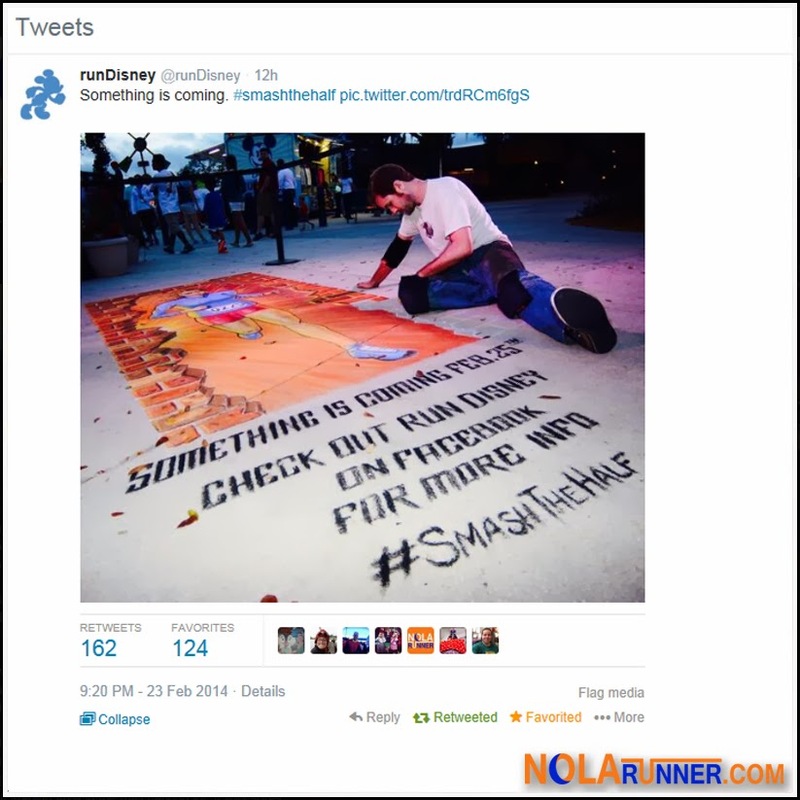 As revealed through the runDisney twitter account (seen in the photos in this post), the final artwork heralds an announcement with a "save the date" invitation and hashtag. A) In late 2013, runDisney announced date changes for one of their race weekends. The Tinkerbell Half Marathon is moving from a late January date in Anaheim to a May date for 2015. The Tinkerbell race weekend was hugely successful in Anaheim, and this year included sold out half marathon, 10K, 5K, and fun run distances. B) The Walt Disney Company recently acquired the distribution rights to the Marvel franchise and its cast of characters. These personalities include The Avengers, which is comprised of multiple blockbuster franchises that feature Iron Man, Captain America, Thor, and The Hulk. I've read in multiple places that use of these characters in the theme parks is limited to the West Coast due to pre-existing attractions at another location in Florida. These two facts come together to help formulate what I (and countless others on social media) expect will be announced tomorrow: A Marvel themed half marathon is coming to Disneyland in January 2015. If you're not convinced by my theory yet, the hashtag #SmashTheHalf and image of a woman running through a brick wall should seal the deal. If you question the obvious, you'll only be making the Hulk angry. RSVP to the official runDisney announcement on Facebook HERE, and find out announcement specifics. As with all runDisney events, it's something you won't want to miss. Check out recaps from my adventures during the 2013 Disneyland Half Marathon Weekend HERE. UPDATE: runDisney announced this morning that it would indeed be adding an Avengers Super Heroes Half Marathon Weekend in Disneyland November 14-16, 2014! Registration opens March 25th, with more details in this video below and on runDisney.com! I agree. I hope I'm right!